Make every day special! with "Breaking Waves" collection handmade ceramic large mug. Use for hot or cold drinks: coffee, tea, juice or water. This rustic "cozy" dripping ceramic mug is hand built from scratch, of speckled clay, using slab technique, shaped by hand. The inside is glazed in different shads of Mediterranean colors: Turquoise, Green or Light Blue, by your choice. The outside is mostly left unglazed, but for the upper part (about 3 cm). 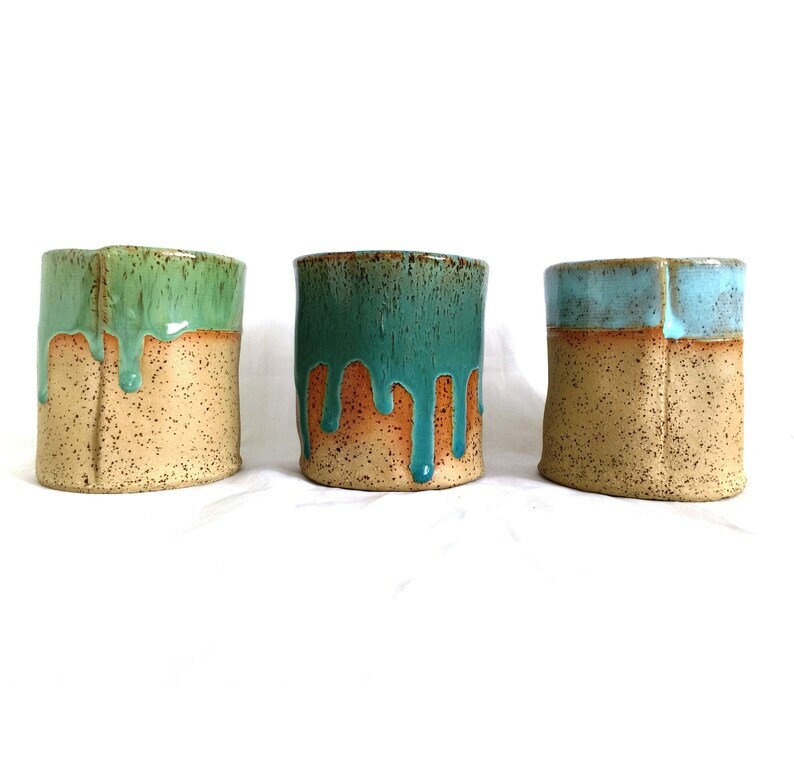 The dripping is natural and different in each mug / cup. A complete surprise each time. * Kiln- fired (twice) at a high temperature of 1200ºC (stoneware). - Average capacity: 400 ml / 14 OZ. Ceramics maintain temperature with high efficiency. Please be careful when using with hot drinks. * Due to the handmade process each ceramic piece and each dripping are a little different but just as beautiful. It takes 3-6 weeks until it is ready to ship. I knead & flatten clay using a rolling pin. I measure, cut & shape each piece by hand. Every mug is hand built from a circle for the base and a long rectangle for the rest (as you can see in the attached photo). In my designs I use lead-free food-safe glazes, leaving most of the outside unglazed for a rustic style, that combines the natural clay matt color with the shiny glaze. Well… It takes few weeks until it is kiln-fired twice and ready to ship.